It's pretty easy to understand why typing isn't exactly an optimal experience on a smartphone. They are designed to fit in palms and come with virtual keys smaller than the fingertips used to press them. Tablets don't suffer from this problem, but they come with one of their own - a user can type speedily using the significantly larger keys, but resting their fingers on the screen for a mere second is all it takes to turn "superpower" to "sauerkraut," and suddenly that status update about whether America should get involved in Syria accumulates a different flood of Facebook comments than was expected. Dryft, a new start-up founded by a Swype co-founder (note the "y"s in place of the "i"s), looks to free tablet typists from the burden of never resting their wrysts... wrists. Most tablet keyboards rely solely on the touch sensor to function, an approach that leads to problems due to the software's inability to distinguish between fingers that are resting and those that are fast at work. Dryft's approach uses the accelerometer in a tablet to know whether or not a user is typing. It also lessens the need to feel for keys by enlarging keys around a user's fingers. Dryft intends to do for tablets what Swype has done for smartphones - whether or not you use it explicitly, your keyboard of choice has probably integrated the gesture-based technique that Swype pioneered. Now here's the fun part. 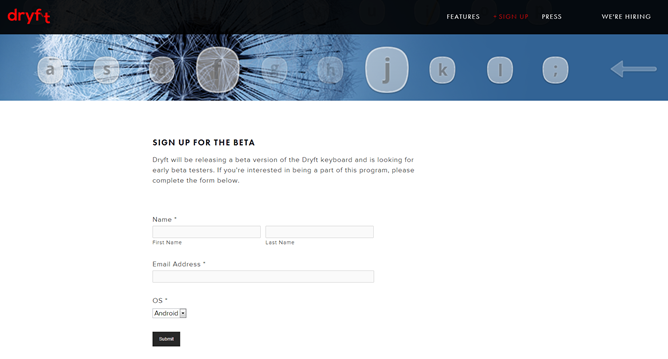 If you want in on this action once it rolls out, you can do so by signing up for the public beta. Dryft isn't available yet, but they will hit you up with an email once the time comes. 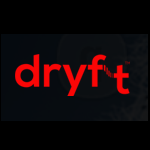 SAN FRANCISCO, CALIFORNIA--(Marketwired - Sept. 9, 2013) - Today at TechCrunch Disrupt, a new start-up named Dryft (pronounced "drift") will be unveiled, on-stage as one of the 30 companies competing for the top spot in the TechCrunch Battlefield competition. Typing is cited as the number one frustration experienced by the over 300 million tablet users today. Dryft solves that problem. Typing solutions are an after-thought in today's tablet because they only utilize the touch senor in the tablet. This single sensor approach makes it difficult for users to rest their fingers on the keys because it is impossible for the onscreen keyboard to tell the difference between when the user resting their fingers or typing. Dryft takes a different approach. Its patented innovation not only uses the touch sensors but also the accelerometer sensor in the tablet to tell the difference between the user resting and typing. This dual sensor approach allows users to type faster and more naturally. Dryft is also the industry's first dynamic keyboard that automatically forms the keys around the user's fingers, eliminating the need to feel the keys. Dryft was founded by Randy Marsden and Rob Chaplinsky. Randy is the original inventor and co-founder of Swype - the leading text entry system for Android smartphones with now over 400 million installations. Rob is the managing partner of Bridgescale - a successful venture capital firm based in Menlo Park. They are joined by former Swype team members and other leaders in the touch interface world. "Swype set the standard for fast text input on smartphones. The need for effective text input on tablets is even greater, creating an incredible opportunity for Dryft," states Randy Marsden, co-founder of Dryft. "As portable computing moves from laptops to tablets, the core productivity app of the knowledge worker, email, is moving with it. Handle strives to let our customers work as fast as they can think and we're excited to be partnering with Dryft to deliver on that promise for composing messages." said Shawn Carolan, co-founder of Handle and Managing Director at Menlo Ventures.